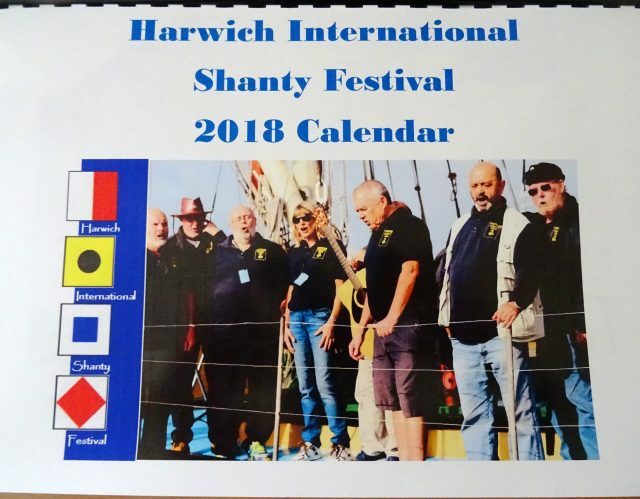 Just a few short days to go before the Historic maritime town of Harwich is once again filled with the sound, colour and entertainment which is the 12th Harwich International Shanty Festival. And there’s plenty of news to update you on. This year there's an event or two on the Thursday (12th October) - details are in the programme! Don’t forget that this year we have a designated Car Park, a ShantyBus running between Dovercourt and Harwich and a Caravan/Camper site. Full details in the Programme and you can book a Camper van space via the Tickets section of the website. Friends of the Festival have a special Buffet Reception, plus mini concert on Friday afternoon. It’s not too late to attend. Join up on the door of the event. There are still a few B&B or self catering spaces left in Harwich/Dovercourt. Contact the Festival if you are still searching for a place to stay. It’s also not too late to volunteer as a Roving Steward. Wander between all participating venues and Pubs in Harwich. What’s not to like? And there is a substantial prize for the Roving Steward who collects the most. Our 2018 Calendar is now available and makes an excellent Christmas present for all those relatives you want to impress! Available over the Festival weekend for £8.00 and afterwards (if there’s any left) by post. Email the festival to enquire. Thanks to all those who contributed photos and especially to Paul Turvey, our Official Festival Photographer. Tickets and Programmes are selling well. Still some spaces left. Go to the tickets section of the website to purchase event tickets. October 15th, the final day of the Festival is also the final day of the old style £1.00 coin. They’re no use to you after that date, so donate them all to us in our collecting tins rather than lose them altogether. Hope you’re all keeping an eye on our Facebook page for daily news bulletins leading up to the Festival. 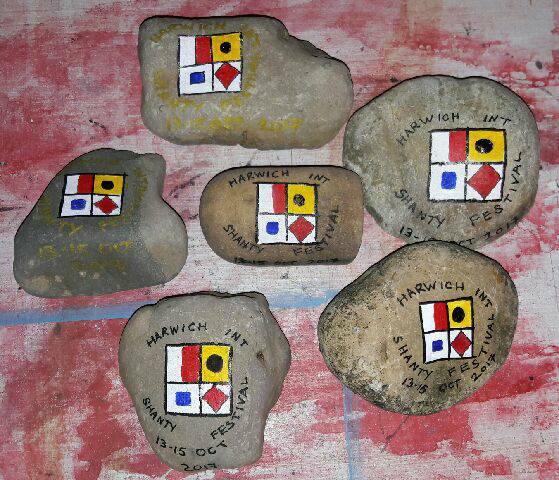 One of the recent items on there features “Harwich rocks” a craze that is sweeping the town. See if you can find any of our very own Shanty rocks over the festival weekend. Harwich & Manningtree Standard has been giving us good coverage in the run up to the festival and we feature on BBC Essex Radio on Tuesday 10th at 1.45 p.m. Look out for more publicity in the next few days. 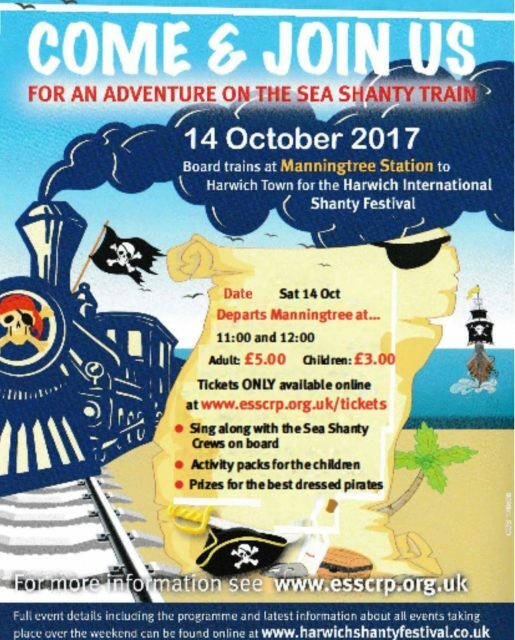 There’s still time to book tickets on the Shanty Train. Visit www.esscrp.org.uk/tickets And don’t forget the Shanty Quiz in this year’s Programme or the Shanty Singing competition in the Alma on Friday. Full details in the Programme of course. 2017 Merchandise will be available from outlets in Harwich over the Festival weekend, including the Ha'Penny Pier Visitors Centre and our roving programme sellers. You can now purchase tickets for certain events over the three days of the Shanty Festival, head to our ticketing site for details. Please note that overnight motorhome parking is by advance booking only, via our ticketting website. 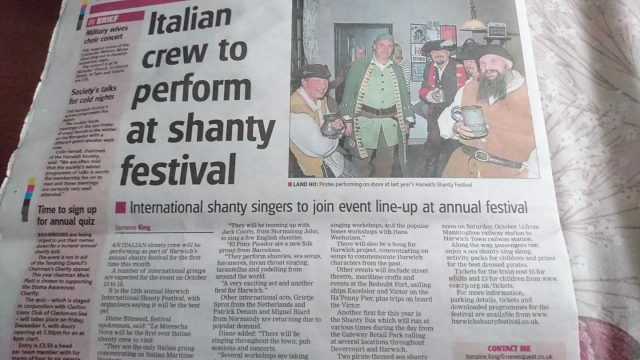 Tickets have just gone on sale for the Shanty Train to the festival. There are limited places on these popular trains, so purchase your ticket early to be sure of a seat!